Дата выпуска: 20 июня 2014г. Тон кожи: Matte translucent in Natural. Чипы: светло-сиреневые (прямо/special ), светло-зеленые (вправо/special ), светло-синие (прямо/special с голографической подложкой), карие (влево/special с голографической подложкой). Макияж: темно-коричневые тени и веки, розово-розовый цвет румян и губ. Особенности: розово-красный лак на ногтях, серьги, особые ресницы. Колечко: стандартное, но ярко-зеленого цвета с блестками. Аутфит: платье, подъюбник, верхняя юбка, шляпка с вуалью, воротничок, сапоги, серьги, нижнее белье. She reigns as queen while growing abundance from the land and growing love in her people. 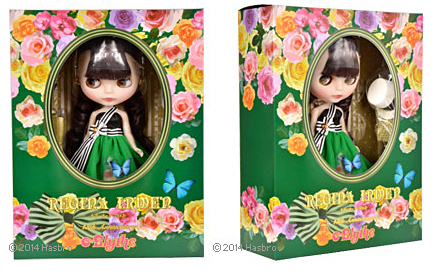 From her lush and beautiful country, long live 13th Anniversary Neo Blythe "Regina Erwen". She has a still and dignified beauty befitting of a true queen. Her fashion taste is elegant and avant-garde. Her color scheme is green, gold, black and white. She wears a lovely dress with top hat and tulle overskirt. he one-piece dress under the tulle is black and white boarder stripes with a black satin bodice. The edge of her gold and black pannier peaks out from beneath the hem of the dress. Combine the green overskirt and her avant-garde look is transformed! There a sweet roses and butterflies adorning the overskirt. She has a special ribbon that crosses over her chest like a lovely sash. Combine this with her top hat and long gold boots and she is ready for a regal event! Her skin has the appearance of soft bisque pottery. She has a special soft lip line that looks like a custom Blythe doll. Her special make up and soft, matte translucent skin gives her the look of a clever woman. She has semi-transparent skin, rose pink blush, and dark brown eyeshadow. She has a new lip line that is soft and realistic looking. The corners of her lips are drawn lovely and give her a soft smile. She has special, thick black eye lashes and dark brown eye lids. She has long hair with bangs and a loose perm. Her dark plum hair is a new mix of brown and purple. There is a radiance and glow to the complex color that resembles a dark grape! She has special eye colors to charm you: brown (hologram backing), light blue (hologram backing), light purple, and light green.